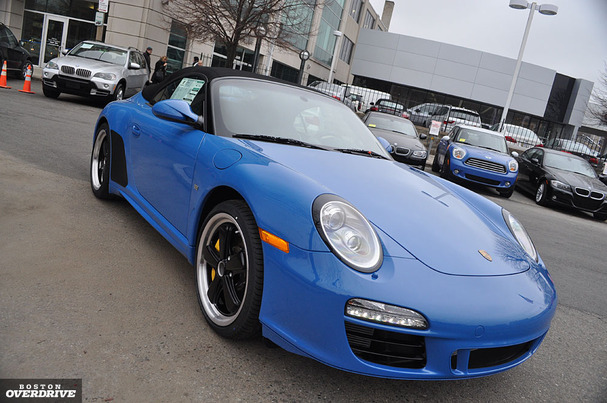 The 2011 Porsche 911 Speedster poses in front of Herb Chambers Porsche in Allston. As Commonwealth Avenue bends past Packard’s Corner, my eyes should be curving right, not fixed to Herb Chambers Porsche, the three-story glass toy box sweeping past my left window. It’s just very hard ignoring the top floor, because there’s always something special upstairs. On Wednesday night, the dealer received a new 911 Speedster, one of only 356 such cars in the world. By new, I mean out-of-the-womb fresh. Plastic has barely come off the paint, a trickle charge umbilical cord sticks out of the hood, and protective inserts in each coil spring mean the Speedster can only walk, not run. That doesn’t stop salesman Mark Webber from reversing it several hundred feet through the service bays and down a ramp so I can get a better photo. He grabs the crested wheel caps from a bag in the bonnet and clicks them in each hub. Now I can tell it’s a Porsche. 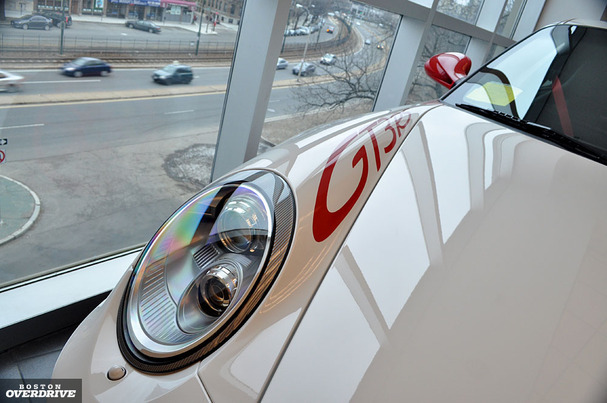 A lonely GT3 RS sits by the window with no owner. General manager Michael Fernandes says he’s already gotten at least 10 serious calls for the Speedster, a far more civil ride than the track-ready GT3. At that rate, it’s unlikely the Speedster will stay long enough to move from the service entrance to the tall windows on the other end of the 20-car showroom. That’s because this Speedster, numbered 33, is one of just 100 cars in the US. The Boston-to-Washington, D.C. corridor is the second biggest market for Porsche, behind California and ahead of Florida, according to company spokesman Dave Engelman. Last year, Porsche sold 24,000 cars in the US. That’s about half of what Chambers sells across his entire 47-dealer franchise. The Speedster celebrates the 25th anniversary of Porsche Exclusive, the made-to-order service that offers near-Bentley levels of customization (Leather-covered air louvers and door handles? Check, and check.) 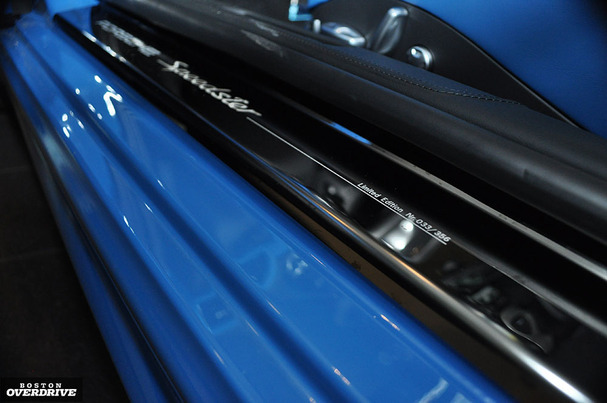 At $204,000 fully loaded, the flame blue Speedster also checks off the Carrera’s entire go-fast catalog. There’s the engine upgrade to 408 horsepower, a 20-millimeter-lower suspension, locking rear differential, carbon ceramic brakes, and PDK dual-clutch transmission. The gnomish rear seats are gone and covered by a double-bubble tonneau lid that hides the manually-operated top. Blue trim electrifies the dark cabin, and the carbon sport seats have checkered flag stripes. I half-expect the blue-stitched steering wheel to sport a galloping horse Ã¢â‚¬â€ the color scheme screams “Grabber Blue” Mustang GT. But before Porschephiles spit in disgust, remember the GT is a serious convertible with a phenomenal 412-horsepower V-8 for about 45 grand loaded (just saying). That a Turbo Cabriolet will run circles around a Speedster for 60 grand less is also not the issue (though if I had a few hundred thousand lying around, it would be). The buyer of this humpbacked 911 with the chopped windshield is betting on collector status. Unlike most 911 models, the Speedster name shows up sporadically in Porsche history. The last of its kind was offered in 1992 and 1989. Before that, the Speedster was based on the 356 and 356 A sports cars from 1954 to 1958. Fernandes is just relieved he can sell a car with a proper top, unlike the Boxster Spyder’s do-it-yourself tent project that shied some customers away. Correction: An earlier version of this article stated that the earliest Speedster models spanned from 1954 to 1955. After hearing from a 1958 Speedster owner, we now know that’s not the case.